Al Jazeera America, the ratings-challenged cable news network that shut down two weeks ago, and which was owned by the Qatari government, was hit with a lawsuit by one of its former employees who alleges among other things that the network lost $585 million in 2013 and 2014. According to The New York Times, Anand Gupta, the former executive vice president of finance, filed a lawsuit in Federal District Court in Manhattan charging the network with denying him a promised promotion and salary increase because of racial discrimination. Gupta’s suit alleges that former chief executive Ehab Al Shihabi had promised to promote him to chief financial officer, but that Al Shihabi’s successor, Al Anstey, reneged on that promise and pushed him out of his job. Citing tax returns, Gupta also laid out details of Al Jazeera America’s financial struggles, saying that it had a net operating loss of $250 million in 2013 and $335 million in 2014. Gupta also asserts that the network is on the hook for another $800 million if it is required to pay out its contracts to cable operators in full. “We strongly disagree with the allegations made in Mr. Gupta’s complaint, which contains many factual inaccuracies, and we intend to vigorously defend the company’s position,” Molly Morse, a spokeswoman for Al Jazeera America, said in a statement on Friday, according to the Times. 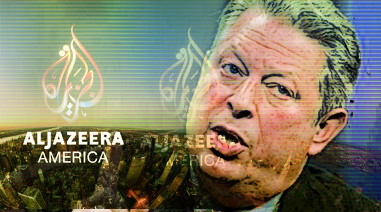 Al Jazeera America was launched with great fanfare after the Qatari government bought Al Gore’s Current TV in 2013 for $500 million and spent an estimated $100 million in establishing news bureaus around the world, including hiring personnel. But it was never able to gain any traction in the ratings, rarely averaging more than 10,000 viewers a night in a cable news universe where the audience is normally measured in the hundreds of thousands, or in Fox News’ case, the millions. As a result of the low ratings, Al Jazeera America was unable to attract advertisers in large enough numbers to help cover their expenses. And once oil prices collapsed, the oil revenue-dependent Qatari government decided to stop throwing its money away on the hapless network. Conservative cablers expressed an interest in taking over Al Jazeera’s cable network distribution, but as of now the channel remains dark and will probably stay that way for the foreseeable future.